This October, I did it! I finally checked off the Annapurna Base Camp trek from my wish list. I had for long been planning to take the ABC trek after one of my close friends, had done this trek almost two years back. I booked a solo Annapurna Base Camp Trek, although the cost was a bit more than joining a group, I chose to do a solo trek as my friend told me that trekking solo was more peaceful. The week before traveling to Nepal, I booked the trek with Third Rock Adventures as these guys seemed legit. The long flight from Seattle to Kathmandu, with multiple transits in between, was tedious but once I reached and landed on the Himalayan soil, I immediately felt happy. Phurba, my courteous guide was standing there with a big smile at the arrival hall, he held a placard with my name written on it in big fonts. After a brief drive through a chaotic traffic, we reached the hotel. After visiting their office to get my permits, I came back to the hotel and slept like a log. Early the next morning, I woke up fresh and ready to start my adventure. We took the first flight to Pokhara, the beautiful city had a lake right beside it. We drove for about an hour and a half to reach a place called Nayapul, where the actual trek started. 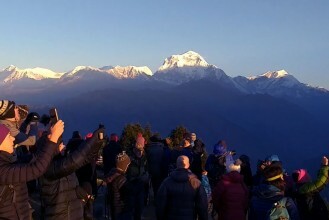 It was almost dark when we reached Ghandruk, I walked through beautiful patches of woods and at times we climbed up above Annapurna Base Camp trek, Annapurna Base Camp trek tree lines. Being a fitness enthusiast, I had already started enjoying the trek. A dash of Thakali Set (Rice/cornmeal porridge with lentil soup meat curry and vegetables) completed the day, Dal-Bhat is a Nepalese staple and it is really tasty and filling, however, I avoided the hot spicy pickles. With heavy stomach, we retired for the night in a teahouse (teahouses are basic dwellings in the mountains of Nepal). The next day we headed off towards our next stop Chhomrong. Phurba was an excellent guide, his receding hairline gave an impression that he was older, but he was just a year older than me. He had stories to tell, he had led the way towards the Annapurna Base Camp for many like me. The trek was quite easy today, after we the quaint village of Chhomrong, we settled on the stone porch in front of the teahouse with some local alcohol and looked out at mighty Annapurna and Macchapuchhre mountains. 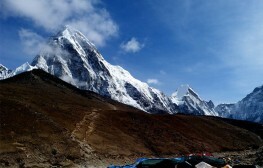 After passing a few more villages and stops in the course of a few days, we finally reached the Macchapucchre Base Camp (Fishtail Mountain Base Camp) which is situated at 12,139 feet. Maybe it was my high excitement level, as I climbed a small rock to take photographs; my left foot got stuck in a small crack on the rock surface and was sprained. The pain kept me awake past midnight, here I would like to thank my guide Phurba, who massaged my foot with some herbal oil, surprisingly by morning the pain was gone. However, the lack of sleep left me quite groggy the next morning. Setting that last step on the Annapurna Base Camp was an ecstatic moment. The beautiful views of the surrounding mountains are simply stunning. The 360-degree panorama of some of the tallest mountains in the world is something to die for; the mountains really make you realize how insignificant you are. The night at the base camp was even more enchanting; I looked up at the stars for a long time, how clearly they looked from up here, maybe because the air is so much thinner. With a heavy heart, we descended down from the base camp; the return trek towards Pokhara was simply as stunning as it started. We trekked past many different villages and settlements in the course of another couple of days. All the while the majestic view of the mountains did not leave us. On a ninth day, we reached a place called Jhinu Danda, (Danda:- hill), this place is famous for its hot springs. I had the most relaxing daytime slumber in the hot spring until Phurba woke me up and escorted me to the lodge. The hot-dip after the long trek was so relaxing that I immediately fell asleep as soon as I landed on the bed. The next day we woke up early and headed towards Nayapul, the same place where I first started the trek. A short drive later, we reached Pokhara I was very excited to try out some boat ride in the ‘Phewa’ Lake. Later in the evening, I and Phurba explored the town the lakeside area was abuzz with live music and people excitedly chatting away, many were locals but there were travelers like me from all over the globe. After 3 beers I decided to hit the sack. 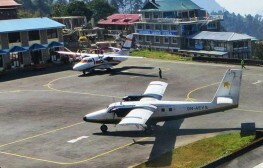 After a hearty breakfast, we headed towards the domestic airport, where we caught a small, noisy twin otter plane and flew back to Kathmandu. I walked around Kathmandu and almost got lost, however, the friendly Nepalese directed me back to a place called ‘Thamel,” here you can meet and talk to travelers from all over the world; it’s a prominent tourist hub. I bought my dad a Gurkha (Nepalese) knife ‘Khukuri’ as a souvenir. 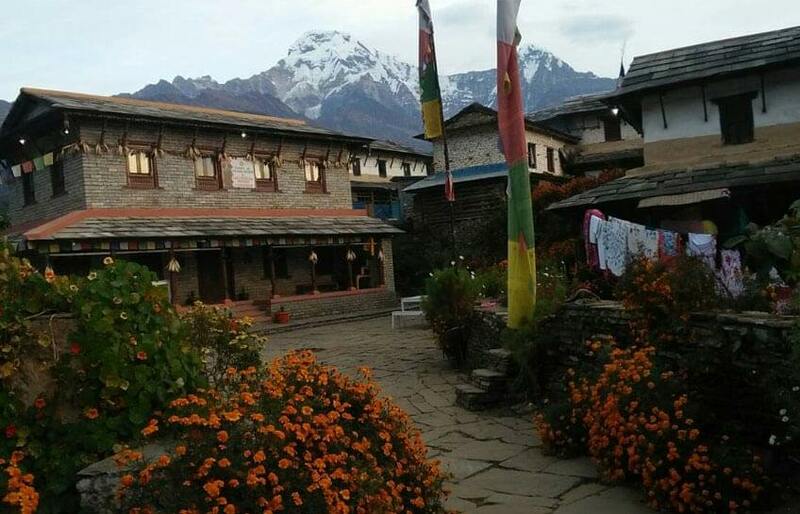 Back at the hotel I looked at all the pictures of the Annapurna Base Camp and smiled to myself, for I knew that this was not my last visit to Nepal. 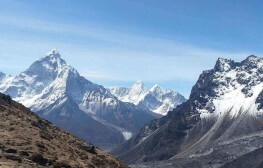 If you are a rugged traveler like me, you will surely fall in love with Nepal at the first glance. Tourists go to Disneyland, travelers travel to Nepal. The mountains have a mysterious pull on you, one visit and you will surely be looking to come back for more. 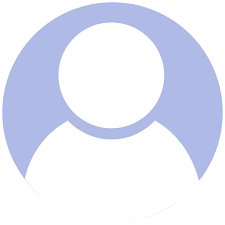 Hello Greg Myres, I hope you are good today. 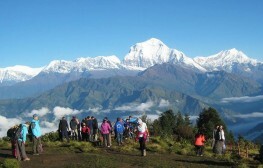 It is nice to see such a nice blog about Annapurna base camp trek. I am a professional hiker. 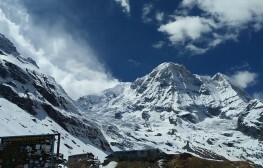 I wanna travel in Annapurna base camp, is it necessary to hide a trek guide or porter. Some company suggesting me hiring a guide and porter? please need a serious help Thanks prasant.